Naming it “hangxiety,” the study researchers found that people who were considered to be very shy were more likely to experience intense anxiety the day after drinking -- in addition, of course, to a hangover. (NEW YORK) — ‘Tis the season for office parties and other social events. But while an extrovert may relish the chance to chit-chat and dance the night away, the super shy among us may have trouble making small talk and require more than a few drinks to lower their inhibitions. It’s a strategy that may backfire, though, according to a new study. 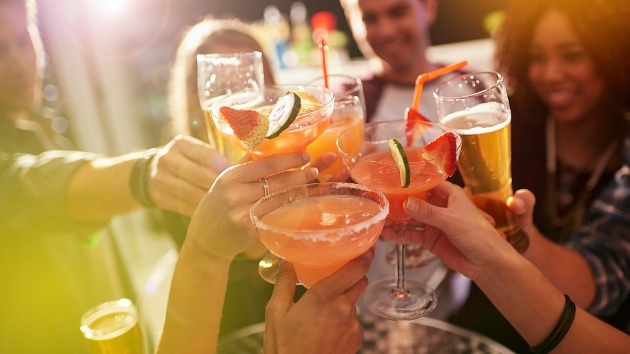 Naming it “hangxiety,” the study researchers found that people who were considered to be very shy were more likely to experience intense anxiety the day after drinking — in addition, of course, to a hangover. But the opposite side of that coin is that a lot of what might have happened while drinking “may not have happened had they been sober. So it’s typical to rethink and agonize over missteps from the previous night of drinking,” Henry noted. Professor Celia Morgan, of the University of Exeter, said in a statement that although the alcohol might help ease social tension in the moment, it could have a “rebound” effect the next day. The study authors added that social anxiety disorder had been associated with alcohol use disorder in the past, but until now there had been little research into the effect of alcohol on anxiety levels in highly shy people. They hope that the findings will encourage shy people to embrace their personalities rather than drinking too much. • Hold yourself to a drinking maximum. If you know that you get too wild after three drinks, limit yourself to only two. • Don’t force it. Ease up on yourself. Don’t push yourself into a situation that you know will make you super uncomfortable. Now, we all have to do things that we just don’t want to do from time to time, but get comfortable saying no if you know that the only way you’ll make it through is to drink in excess. If that’s the case, it just not healthy for you to put yourself in that situation and you don’t need to be there. • Take baby steps. If social situations give you anxiety, you’re not alone. Plenty of people suffer from social anxiety and cope by easing themselves into social situations slowly. Try things like giving yourself a predetermined time limit if you commit to going to a gathering; ask a friend to tag along; and talk to at least three people, then say your goodbyes and head home proud of yourself for making it through.